A “Class of 1971” inductee, Johnny Bower is the only player to win the American Hockey League MVP award for three consecutive seasons, from 1955 to 1957. He is the AHL’s all-time leader in wins (359) and shutouts (45). John also recorded the league’s best goals-against average three times. 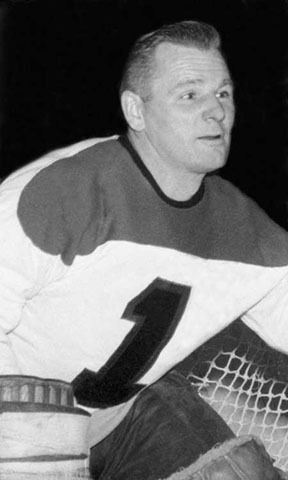 Throughout his time with the Reds in 1945 and then from 1955-1957, Bower compiled a 75-34-10 record and a 2.61 GAA in 119 games. He led the Reds’ to their great Calder Cup win in the 1955-56 season. A national icon in Canada and hero in Toronto, he was nicknamed “The China Wall”, famous for his fearless play. Playing maskless his entire career, he lost practically every tooth over his career. His most dangerous move was his patented technique of diving, head-first to poke check of the puck off the stick of oncoming skaters. Winner of 4 Stanley Cups during his career with the Toronto Maple Leafs, he was enshrined in the NHL Hockey Hall of Fame in 1976, Johnny was also named one of the “100 Greatest Players in NHL History” on January 1, 2017. He is one of only a handful to have his number honored by the Leafs. Over his NHL career between 1953-1970, he compiled a 250-195-90 record, which included 37 shutouts with a 2.51 GAA in 552 NHL games. He was inducted into the American Hockey League Hall of Fame in 2006.